DNA Replication, also known as Semi-Conservative Replication, is the process by which DNA is essentially “doubled”. It is an important process that takes place within the dividing cell. In this article, we shall look briefly at the structure of DNA, at the precise steps involved in replicating DNA (initiation, elongation and termination), and the clinical consequences that can occur when this goes wrong. DNA is made up of millions of nucleotides; these are molecules composed of a deoxyribose sugar, with a phosphate and a base (or nucleobase) attached to it. These nucleotides are attached to each other in strands via phosphodiester bonds, to form a ‘sugar-phosphate backbone’. The bond formed is between the third carbon atom on the deoxyribose sugar of one nucleotide (henceforth known as the 3’) and the fifth carbon atom of another sugar on the next nucleotide (known as the 5’). There are two strands in total, running in opposite or antiparallel directions to each other. These are attached to each other throughout the length of the strand through the bases on each nucleotide. 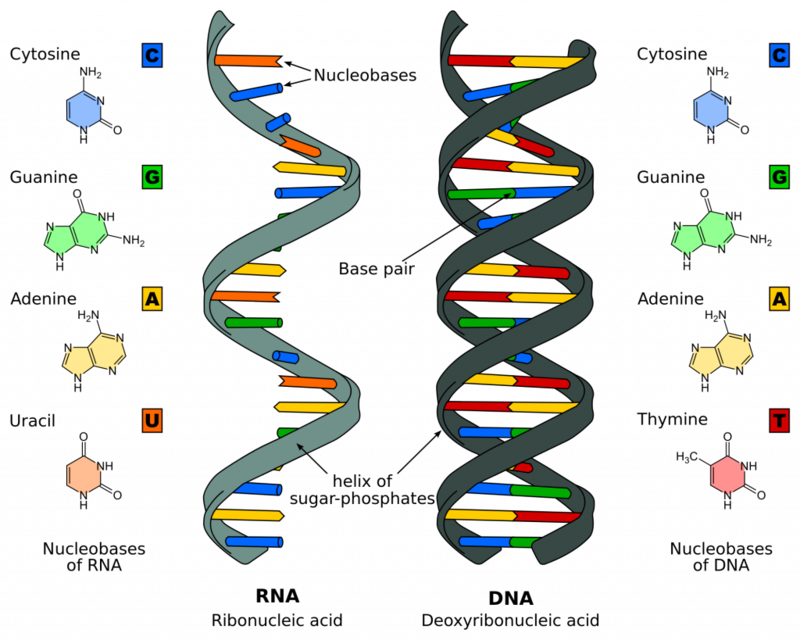 There are 4 different bases associated with DNA; Cytosine, Guanine, Adenine, and Thymine. In normal DNA stands, Cytosine binds to Guanine, and Adenine binds to Thymine. The two strands together form a double helix. DNA synthesis is initiated at particular points within the DNA strand known as ‘origins’, which are specific coding regions. These origins are targeted by initiator proteins, which go on to recruit more proteins that help aid the replication process, forming a replication complex around the DNA origin. There are multiple origin sites, and when replication of DNA begins, these sites are referred to as Replication Forks. Within the replication complex is the enzyme DNA Helicase, which unwinds the double helix and exposes each of the two strands, so that they can be used as a template for replication. It does this by hydrolysing the ATP used to form the bonds between the nucleobases, therefore breaking the bond between the two strands. DNA can only be extended via the addition of a free nucleotide triphosphate to the 3’- end of a chain. As the double helix runs antiparallel, but DNA replication only occurs in one direction, it means growth of the two new strands is very different (and will be covered in Elongation). DNA Primase is another enzyme that is important in DNA replication. It synthesises a small RNA primer, which acts as a ‘kick-starter’ for DNA Polymerase. DNA Polymerase is the enzyme that is ultimately responsible for the creation and expansion of the new strands of DNA. Once the DNA Polymerase has attached to the original, unzipped two strands of DNA (i.e. the template strands), it is able to start synthesising the new DNA to match the templates. This enzyme is only able to extend the primer by adding free nucleotides to the 3’-end of the strand, causing difficulty as one of the template strands has a 5’-end from which it needs to extend from. One of the templates is read in a 3’ to 5’ direction, which means that the new strand will be formed in a 5’ to 3’ direction (as the two strands are antiparallel to each other). This newly formed strand is referred to as the Leading Strand. Along this strand, DNA Primase only needs to synthesise an RNA primer once, at the beginning, to help initiate DNA Polymerase to continue extending the new DNA strand. This is because DNA Polymerase is able to extend the new DNA strand normally, by adding new nucleotides to the 3’ end of the new strand (how DNA Polymerase usually works). However, the other template strand is antiparallel, and is therefore read in a 5’ to 3’ direction, meaning the new DNA strand being formed will run in a 3’ to 5’ direction. This is an issue as DNA Polymerase doesn’t extend in this direction. To counteract this, DNA Primase synthesises a new RNA primer approximately every 200 nucleotides, to prime DNA synthesis to continue extending from the 5’ end of the new strand. To allow for the continued creation of RNA primers, the new synthesis is delayed and is such called the Lagging Strand. The leading strand is one complete strand, while the lagging strand is not. It is instead made out of multiple ‘mini-strands’, known of Okazaki fragments. These fragments occur due to the fact that new primers are having to be synthesised, therefore causing multiple strands to be created, as opposed to the one initial primer that is used with the leading strand. The process of expanding the new DNA strands continues until there is either no more DNA template left to replicate (i.e. at the end of the chromosome), or two replication forks meet and subsequently terminate. The meeting of two replication forks is not regulated and happens randomly along the course of the chromosome. Once DNA synthesis has finished, it is important that the newly synthesised strands are bound and stabilized. With regards to the lagging strand, two enzymes are needed to achieve this; RNAase H removes the RNA primer that is at the beginning of each Okazaki fragment, and DNA Ligase joins two fragments together creating one complete strand. Now with two new strands being finally finished, the DNA has been successfully replicated, and will just need other intrinsic cell systems to ‘proof-read’ the new DNA to check for any errors in replication, and for the new single strands to be stabilized. Sickle Cell Anaemia is an autosomal recessive condition which is caused by a single base substitution, in which only one base is changed for another. In some cases this can result in a ‘silent mutation’ in which the overall gene is not affected, however in diseases such as Sickle Cell Anaemia it results in the strand coding for a different protein. In this case an adenine base is swapped for a thymine base in one of the genes coding for haemoglobin; this results in glutamic acid being replaced by valine. When this is being transcribed into a polypeptide chain the properties it possesses are radically changed as glutamic acid is hydrophilic, whereas valine is hydrophobic. This hydrophobic region results in haemoglobin having an abnormal structure that can cause blockages of capillaries leading to ischaemia and potentially necrosis of tissues and organs – this is known as a vaso-occlusive crisis. These crises are typically managed with a variety of pain medication, including opioids and NSAIDs depending on the severity. Red blood cell transfusions may be required in emergencies, for example if the blockage occurs in the lungs. Fig 3.0 – The difference in structure between normal red blood cells, and those affected by sickle cell disease. Which sugar is DNA made of? How are the nucleotides attached to each other in DNA? Which of the following bases is NOT associated with DNA? Which enzyme is responsible for unwinding DNA? 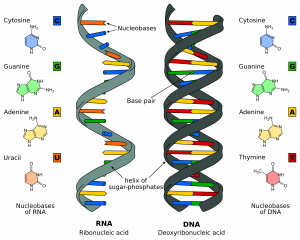 Which enzyme is ultimately responsible for the creation and expansion of new strands of DNA? Which of the following are made of Okazaki fragments? Which of the following enzymes are important for termination of DNA replication? 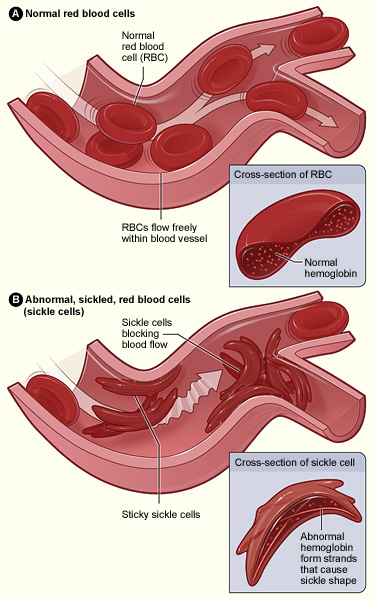 What is the abnormality in sickle cell anaemia? Which nucleotides are swapped in sickle cell anaemia?